post for the link to the tutorial. 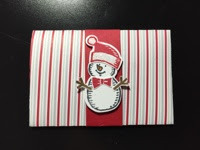 Stampin' Up' Snow Place stamp set cute? Or perhaps you prefer traditional Christmas trees. Would you like to know how to make these?